The Jeffs beat Wesleyan at home before falling to the Cardinals the next weekend. While much of the Amherst student body finished the fall semester and went off to enjoy the holidays, the men’s basketball team remained hard at work throughout December and the first few days of the new year to build momentum over the middle of the season’s slate of games. The Jeffs — currently ranked No. 7 in the nation — played three games in the week before exams, traveling to Babson and Brandeis before hosting Anna Maria College. Despite posting a 2-1 record for the week, the Jeffs went into their short holiday disappointed after dropping their first game of the season. While Babson hung around against the Jeffs, eventually fading after a second half barrage by David Kalema ’14 to give Amherst a 61-50 win, Brandeis proved less kind to the Jeffs. The Judges took a four point halftime lead with a buzzer-beating three and never looked back, keeping Amherst at bay and blowing out the Jeffs by a 76-61 margin. Willy Workman ’13 led the team with 17 points, and Jeff Holmes ’12 added 15 points and seven boards, but the team missed the presence of sidelined point guard Aaron Toomey ’14. Enduring the year’s first dose of adversity, the Jeffs responded by unleashing their frustration on Anna Maria to run away with a 76–57 victory. Taylor Barrise ’12, Pete Kaasila ’13 and Holmes all came through with 14 points, while Kaasila and Holmes grabbed 17 combined rebounds. The Jeffs resumed play on Dec. 30, taking on Marymount Univ. Amherst came out strong and jumped out to a 17 point halftime lead, managing to hold off the Saints in the second half for a comfortable 81-66 win. The new year brought a set of three home games, giving Amherst a chance to regain more confidence after the dispiriting loss to Brandeis - the only blemish to an otherwise perfect record. Wesleyan came to LeFrak as the Jeffs’ first opponent. Amherst had won five straight meetings against Wesleyan since the 2008-09 season, but an improved Cardinals squad refused to be pushovers this time around. A sloppy first half culminated with a 28-18 Amherst lead, but the quality of play picked up significantly as the game went on. Wesleyan stormed back and took a one point lead with 4:16 to play, but the Jeffs remained resilient. Kalema scored on a strong drive to give Amherst a late two point lead, and Toomey clinched the game at the line, giving the Jeffs a tight 66-64 victory. Toomey’s 15 for 18 performance at the charity stripe en route to 22 total points likely saved Amherst in this one, as the rest of the team went only five for 14. Toomey also came out strong against Conn.College, tying a career high with 23 points in a 74-62 win. The game was no blowout, however, as the Camels led by as much as five midway through the second half before the Jeffs put the game away with efficient inside play. The interior presence of Kaasila and Holmes was essential in this one, as the team shot a relatively weak 5-for-25 from three-point range. The long-distance shooting improved slightly against Hamilton in the team’s next game, but a 19 for 22 free throw shooting performance and a commitment to rebounding were keys in the Jeffs’ 85-68 win. Toomey led the team with 17 points, while Barrise and Holmes dropped 15 each to extend the Amherst home-winning streak to 23 games. After prevailing against Wesleyan during the homestand, Amherst found less success at the Cardinals’ home gym on Jan. 17. The game was a furious, back and forth battle throughout — the Jeffs led 31-30 at the half, but Wesleyan was the team with momentum going into the locker room, having just ripped off a 20-9 scoring run in a comeback effort. The Cardinals led for most of the second half, but Toomey sank a pair of free throws with 7.4 seconds left to put Amherst up by one. However, the Cardinals responded with two clutch free throws of their own with 5.2 seconds remaining, and Toomey’s desperation attempt at the buzzer fell short. The 67-68 setback was the second of the year for the Jeffs. Barrise played well in the loss with 23 points and also captured fourth place on Amherst’s career three-point scoring list. The foes from last weekend, Bowdoin and Colby, proved an easier task than the pesky Cardinals. 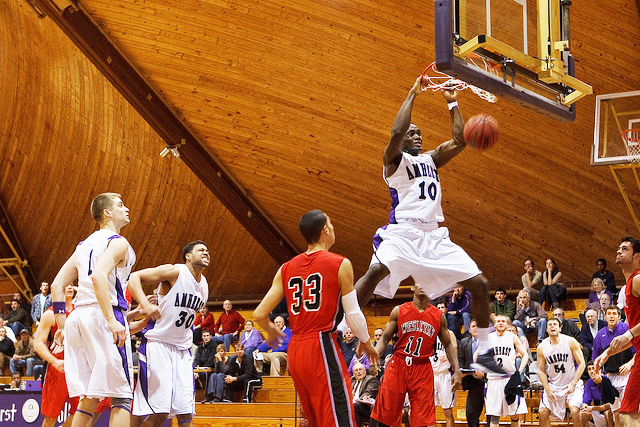 David Waller ’12 scored 22 points against Bowdoin, leading the way in a 80-66 road win. Barrise moved into second place on the three-point list with 192 long range field goals, and added another trey against Colby to inch within five three pointers of tying the program record of 198. However, Waller proved to be the go-to guy once again against Colby, pouring in 18 points. Toomey added 16 points, nine assists and a career high six steals. After the onslaught of games over the break, the Jeffs travel to archrival Williams Wednesday and then journey to Trinity on Saturday before coming back home to play RIC. Barrise has a good chance to break the Amherst three-point field goal record this week, and his contributions will come in handy against the 13th-ranked Ephs in particular.